It’s Fall and we need you! Come build with us Saturday, November 17–we’re completing drywall installation at the Pena house in Sykesville. We made great progress last Sunday and almost finished all exterior walls. 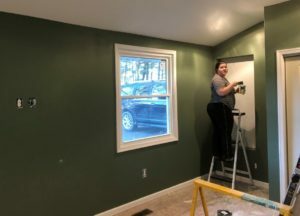 The next step is identifying a finishing company to prepare the walls for paint. Please contact John (240-498-7505) if you have a lead on finishers. Please register no later than the Thursday before the scheduled work day. If you cannot work the entire day, just note your available hours on the form. Cost is $10 per missioner for supplies. Lunch, water and snacks are provided. Please note: The November 11 workday is cancelled. We regret we have to postpone the Nov. 3 workday, but the Nov. 4 and Nov 11 workdays (both Sundays) are still scheduled, and we need as much help as possible on those dates, even if you can only work a partial day. On Sunday, Nov. 4 work continues on the Pena house in Sykesville. We’ve had several work days at this location, and this Sunday is the last currently scheduled. We’ve made great progress but there is still much work to be done. 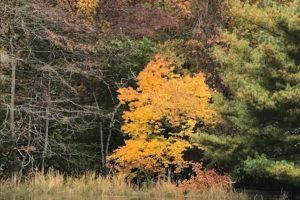 The following Sunday, November 11 will be a workday for the Fall ARC Project in Ellicott City. 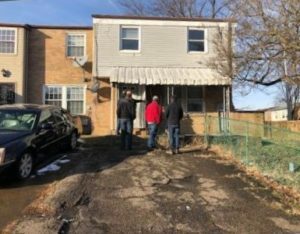 DreamBuilders is working with Arc of Howard County to renovate a group home for developmentally and cognitively challenged individuals, so they can have choice and control over all aspects of their lives–including where they work, live, and spend their time. This two-part project involves improving the basement and the screen porch. The basement area is in need of new walls, a handrail for the steps, and a custom door. The screen porch requires wheelchair accessibility, to include a ramp with a handrail, along with removing panels to cut in new door openings and reframing. The house is located on Valley Road in Ellicott City. Register for either work day by clicking the appropriate date link below. Please register no later than the Thursday before the scheduled work day. If you cannot work the entire day, just note your available hours on the form. Cost is $10 per missioner for supplies. Lunch, water and snacks are provided. Dreambuilders is looking for a volunteer with some unique skills to fulfill a vitally important role. 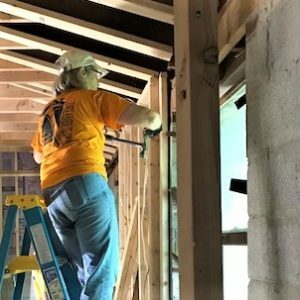 While Dreambuilders participates in construction-based mission projects locally, nationally and internationally, this role doesn’t require job site participation or travel. We are seeking an individual with Public Relations experience to interface with press, media and social media. 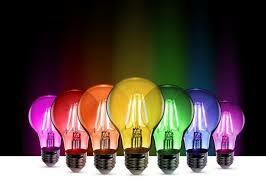 The right person will help the organization receive much needed publicity. That exposure will have a huge impact on our ability to secure donations of building materials, raise funds, and improve the lives of so many people. If you have experience and talent in this area and would be willing to donate a bit of your time in conjunction with each of our planned missions, please contact Amy Levitt at levitt5@verizon.net by November 10th. 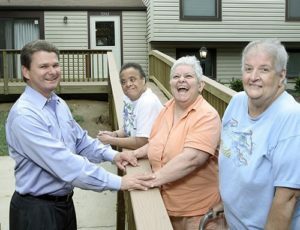 DreamBuilders has a long-standing partnership with The Arc of Howard County to improve homes, fostering community acceptance and inclusion for developmentally and cognitively challenged individuals. 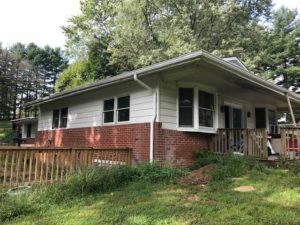 In November, we’ll renovate a group home in Ellicott City. This two-part project involves improving a basement and a screen porch. The basement area is in need of new walls, a handrail for the steps, and a custom door. The screen porch requires wheelchair accessibility, to include a ramp with a handrail, along with removing panels to cut in new door openings, and reframing. This effort literally improves Arc clients’ choice and control over where they live and spend their time! We can use 12 volunteers each day. The workday will be 8:30 – 4pm. Lunch will be provided. Cost per volunteer is $10. For more details, please see the sign-up links. 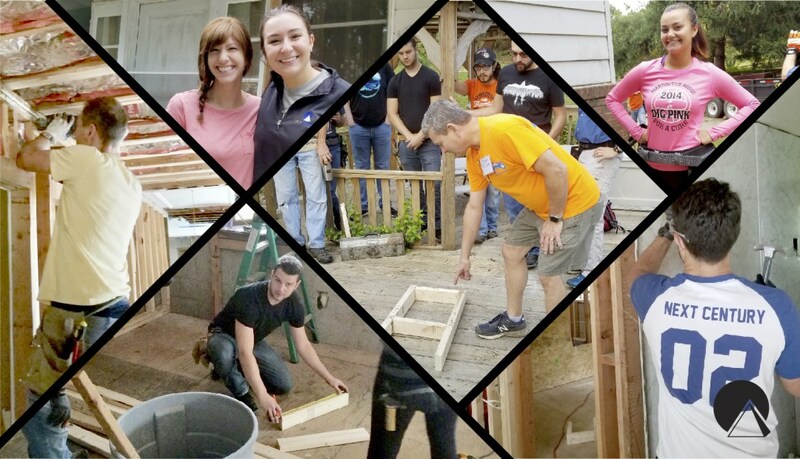 Last Friday, Next Century Corporation employees were hard at work–volunteering at the Pena home. Several employees had hoped to arrange a community service event to support the local community. The opportunity arose when our very own John McBeth, (also, Next Century CEO) suggested a day at the Pena renovation project. 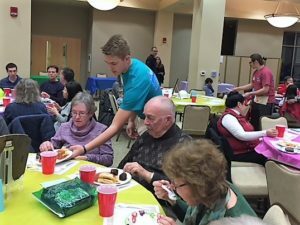 Kudos to the Next Century team for giving back to the community! The rafters have been repaired; a new front door was installed, and the interior framing is 90% complete.